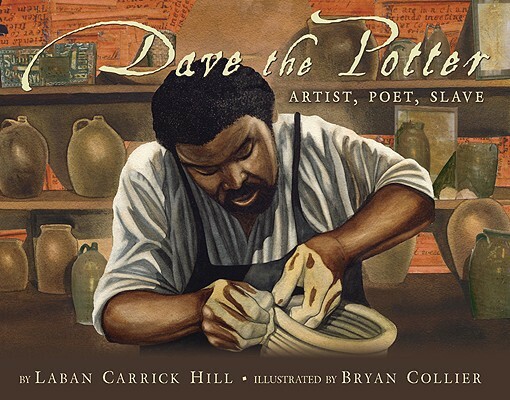 I know that the Caldecott awards are given for illustrations in picture books, but I was quickly caught up in Laban Carrick Hill’s story of Dave the Potter, an artist who created pots to hold grain, salted meat, and memories. A poet who, in simple two-line compositions, etched history and complex ideas into his creations. A slave with a skill possessed by very few people, let alone other slaves. Bryan Collier’s illustrations certainly play a role in drawing readers in. Each picture is deep and rich, seemingly made of clay themselves, and take readers through the entire process of making a pot as a potter would in early to mid 1800's. Readers can see the pride and care Dave put into each pot and jar. The book ends with three pages of details about Dave’s life and work mixed in with examples of his poems that are etched into the sides of his pots. There is also a full page with the author’s and illustrator’s notes explaining how they each learned about Dave the Potter and how the book came to be. 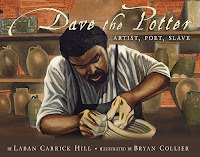 Dave the Potter shares a small piece of American history that few people know (at least I didn’t know about it) and middle and upper elementary teachers can use the book as a resource for Black History month, art and pottery, and even poetry.